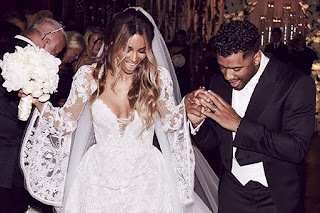 Kemi Online ♥: Ciara and Russell Wilson are married! Congratulations to gorgeous R&B star Ciara and fiancé Seattle Seahawks quarterback Russell Wilson who got married in England today! 100 of the couple’s closest family members and friends attended the beautiful intimate ceremony which took place at the Peckforton Castle in Liverpool.